Here’s a romantic 1-bedroom cabin tucked away in its own world, peaceful and fun for people who are very happy in their own company. It’s Almost Paradise, a good place for love, and even beloved pets can come too. Talk important things relaxing in the Amish rocking chairs, gently drifting on the porch swing, or lazing in the hot tub. All this, on the private back porch where the view is sheltered and serene, just you and the trees. 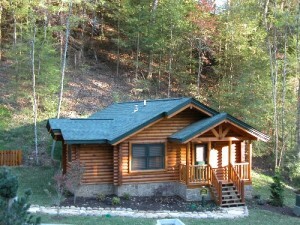 Come inside the cabin with its lodge-style furnishings and snuggle by the fireplace in the living room. Enjoy the entertainment amenities: shoot some pool, play music, watch a movie. Move from the fireplace in the living room to the the fireplace in the king-bed master suite. Shower in the vertical jetted shower spa or lie in the heart-shaped jacuzzi – dry off by the fire or just stay in the water forever! 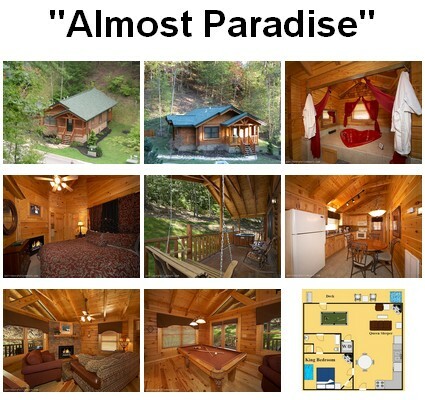 Like many of our cozy 1-bedroom cabins, Almost Paradise is the perfect honeymoon cabin. Stay in your own world, or step off the deck and venture out to other worlds. The cabin is located in the beautiful Gatlinburg Falls Hidden Valley Resort, with its summer swimming pool and its own wedding facility. Beyond the Hidden Valley world sits Gatlinburg, and Great Smoky Mountains National Park, two more worlds of Appalachian music and craft, festivity, entertainment, fun and adventure, with Smoky Mountains all around, everywhere. Can life be this perfect, this Almost Paradise? Yes, it can. Click here to check availability and book Almost Paradise for your next trip!